Before I get into it – I would like to apologise about the lack of my Musings post last Monday. I took the day off sick, as I’d had bugger all sleep… and kinda forgot about it! I’m not sure what goals you all have in your life… but I know that with mine I have a crap load. Yes. Heaps and heaps of them. And I will keep pursuing these goals until I finally get there, not matter how long it takes me. Is this wrong? I don’t think so. I think that it’s driven, and it gives me something else to think about instead of the mundane everyday stuff that I have to put up with. I’m a dreamer… always have been – always will be. But how is this measured? Well. I keep a Hopes and Dreams book, where I write down all sorts of things in it. (Yes, winning the lottery is written down in the dreams section!) But in reality… this is more of a goals book, with a little bit of fantastical dreaming mixed in. If the dreams come to the life of reality, then my world will be all the more richer for it. Another of my dreams, is to one day hit the Whitcoull’s Top 100 List. This has always been a dream, but more importantly – it also keeps my writing and goals in perspective. I’m not sure I’ll ever get there… in fact, at the moment I highly doubt it since it looks as though that particular bookstore is going under. But there will be another ‘bookstore list’ I can dream about some day. For today, I’ll stick with Whitcoull’s. I also measure my writing progress in six month increments. I find that if I set goals and plans for a year – it’s too long. Six months feels about right. It goes fast, and you would be surprised at how fast it actually goes!! Then I can revise it, carry over some of the straggling tasks and goals, and continue onwards and upwards. And why am I yabbering on about goals, hopes, and dreams you may ask? Well… because of all the editing and revising that has been happening in my world. With each page and chapter I complete – my dreams get just that little bit closer. So, what am I amusing myself with this week? We need a new bed. I am not kidding. I have just about had enough of the bed we currently have. Every time my husband even sniffs, I feel it. And it’s killing me. By the time I get to Thursday or Friday of the week, I am freaking exhausted from not getting quality sleep. But it’s the same for him as well. We are constantly waking each other up, all night long. Not to mention… my back is killing me at the moment! The other day we were in a shop browsing around (dreaming), and we came across this bed. We both lay down on it, and just knew that even though it was situated the midst of a busy shop, we could actually go to sleep right then and there. Trust me… if I had the cash right now, I would be getting a new bed. Bugger finishing off building our wardrobe… a decent bed is our next priority after we sort the other room out this coming summer. NaNoWriMo officially starts on 1st November. Good grief. I was just saying this morning that I am more confused that a chameleon stuck in a box of crayons at the moment over this. I have so many ideas, and yet, no idea what to work on this November. My big question is around whether I should keep writing the Trilogy over this November, or if I should pull out some fresh ideas and try my hand at something new? Bah. No idea. See? Still confused. I didn’t finish a short story I was trying to write in September. You never know though – I still might. I was enjoying it, and the processing of new and wild ideas. I also didn’t review the books that I wanted to get through, and even the books that I started reading were put down. My tolerance levels for mediocre writing has dropped significantly, and I just can’t be bothered wasting my precious time on them anymore. Now I am reading a stellar book and really pleased that I ditched the others! Yesterday afternoon, I decided that I was truly sick of my dining area that I never use properly. And I was also annoyed that there was one sofa in our living room that hogged the heater all the time, not to mention, I felt that our entire living area was centred around the TV, and if I wanted to sit and read, I would have to share my mental space with the TV as well. So…… I put my problem solving hat on, and switched a few things around. Now I have a lovely space at the opposite end of the living room that has one of our sofas, a nice big rug, currently an ottoman, and plenty of space to stretch out and enjoy a good book. It looks out over the garden, has loads of light, and I can open the window and enjoy a bit of the outside world as well. My husband sat there in this new space last night, and chatted to me while I pottered in the kitchen. It was excellent, and he could still watch the news at the same time. Much more family inclusive. And my cat loves it. Sorry about the quality of the photo! 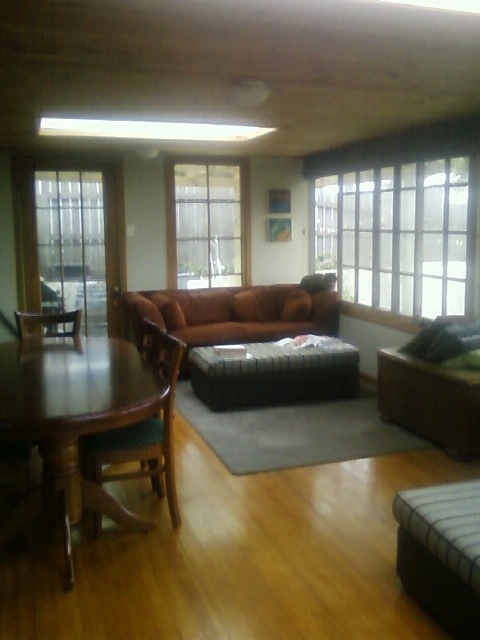 To give you an idea of what it was like before – well – the dining table area covered that whole rug – and I never used it! And the dark red sofa sat in fron of the grey rug facing towards the camera, and effectively, it was the heater hog sofa. I’m rather pleased with the end result! On the writing front, there should be a lot more, but I’m still editing. Very slowly. 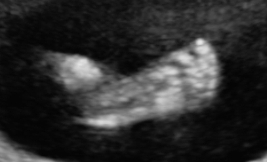 Oh yes, and for those of you who don’t know – my husband and I are expecting our first child in February. For the moment, we are calling it Bumpkin till it’s born. Exciting, yes… Challenging? Already. And another one of those reasons why my concentration is completely blown out of control. But I will get it back – hopefully through the participation of NaNoWriMo this year. I really think that’s about it from me at the moment. Lots on, but at the same time, not much at all. Voila. Monday Musings is officially over for the week. Ciao for now. Congratulations on Bumpkin! That’s fantastic news! I hope things go well and healthily and aren’t too harsh on you. I love your living room! So bright and open and yet still looks cosy looking. I’m hugely goal-oriented too, Leigh. I love these goals you mentioned. Good luck and keep up the great work. PS: a good bed is essential! Ha! Don’t I know it! I have been putting up with mediocrity for far too long if you ask me!! Actually – only a year. We decided that we could no longer sleep in a queen size bed. he’s too tall, and I like my space… then we went to a king that we had sitting at the batch, and hey, what do you know. Its all soft and floppy, and rolls together.